No matter where you decide to do some fashion shopping in Canada you are sure to find a store to suit you in any province that you are visiting. For those that like a shopping excursion that can take place under one roof then it will mean a visit to the West Edmonton Mall. At one time this was known as the largest mall in the world but it no longer holds this title. There is no shortage of stores as over 800 of them have made this mall their home. One of the great advantages to shopping here is there is plenty to keep the kids entertained which you check out the latest fashion deals. When people are going to visit Ontario, there are two favorite locations that they will go to. One is Toronto and the other in Ottawa. 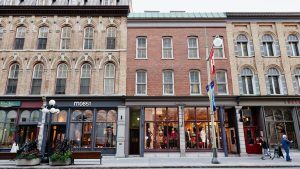 While the main attraction in Ottawa may be the parliament buildings, there are plenty of shopping locations that are quite impressive. Here, some of the best fashion attire can be found where one may not expect it. This is at the famous ByWard Market that has a whole collection of vendors that carry everything from fresh produce to jewelry and some very unique and fashionable clothing. The only problem with fashion shopping in Toronto is trying to determine which stores one wants to go to first. There is the famous Eaton Center which is a big tourist attraction and one that is easily accessed in the Toronto downtown core. But aside from this, there is Yorkville which is like a village of its own. Here many boutique fashion shops will surely have something to please everyone. Famous brand names like Hugo Boss, Prada, and Burberry, can be found here. All the great shopping is not just restricted to Toronto. It means a short trip to Markham Ontario. Especially for those who are into Asian fashion. Here one will find the largest indoor Asian Mall throughout North America, known as the Pacific Mall. Aside from the best in Asian fashion, all kinds of goods can be found here. Many who visit here are caught up with the history and the beauty of this city. Going past this beauty entails moving onto some of the great shopping opportunities that can be enjoyed here. For those who want a truly unique experience, it means paying a visit to Simons Department Store. Historically this dates back to 1840, but for the fashion conscious they will not be disappointed with the findings here. These are just a few prime examples of fine apparel shopping throughout Canada. Many could be added to the list. Anyone on a shopping excursion should not neglect some of the smaller shops that will surely be present in almost every province throughout Canada. Some of the shops carry a full collection of different types of attire, while others have chosen to specialize.